Mike Tyson Mysteries is an American adult animated television series, and the first to be produced by Warner Bros. Animation for Adult Swim. It premiered October 27, 2014. 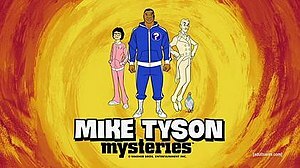 The series features Mike Tyson solving mysteries, in the style of I Am the Greatest: The Adventures of Muhammad Ali, Scooby-Doo!, Jonny Quest, and Mr. T. On December 10, 2014, Adult Swim renewed the series for a second season, which premiered on November 1, 2015. A third season premiered on May 14, 2017, and the remaining Season 3 episodes aired from March 4, 2018 to May 13, 2018. From left: Yung Hee Tyson, Mike Tyson, Marquess of Queensberry, and Pigeon. A fourth season, set to air by August 2019, was announced on July 24, 2018. The show follows Mike Tyson, the ghost of the Marquess of Queensberry, Tyson's adopted daughter, and a pigeon as they solve mysteries. The style of the show borrows heavily from 1970s cartoons, most notably Hanna-Barbera productions such as Scooby-Doo, Where Are You? and The Funky Phantom. However, it also contains adult language and concepts, in the manner of Family Guy, or South Park, and many other Adult Swim shows. While each episode involves a mystery as a framing device, often these are ignored altogether while the plot takes another direction as the mysteries are usually never solved, and episodes sometimes end on cliffhangers which are never resolved. Mike Tyson (voiced by himself) – The title character of the series, Mike Tyson is a retired boxer who now solves mysteries. He is portrayed as being wildly out of touch with reality, confusing a chess Grandmaster with the Grand Wizard of the Ku Klux Klan, or Elon Musk with Elton John, thinking a binary code spells out 'Ooo', and eating junk food without realizing he's on a diet. He has a reputation for doing unusual things like taking an oatmeal bath with cooked oatmeal, owning a pet grizzly bear, and using mosquitoes to help him sleep, along with pronouncing the names of many other characters incorrectly, even by calling his own daughter Yang or Yee instead of Yung. Pigeon (voiced by Norm Macdonald) – An alcoholic, sexually depraved, sarcastic pigeon. He is a former human who was turned into a pigeon by his ex-wife as a curse for cheating on her. His real name is revealed to be Richard, although everyone still calls him Pigeon. Pigeon is disliked by Marquess and Yung Hee, but Tyson is seemingly oblivious to his obnoxious nature. Yung Hee Tyson (voiced by Rachel Ramras) – Mike's 18-year-old adopted daughter. Born in 1998, she was left by her birth mother on Mike's doorstep when she was a baby. A running gag in the series is Yung being repeatedly mistaken for a boy. Marquess of Queensberry (voiced by Jim Rash) – The deceased real life father of modern boxing the Marquess of Queensberry, is an alcoholic, narcissistic and flamboyant ghost who provides Mike with intellectual advice. The Marquess portion of his name is pronounced "Marcus" and rendered as if it is his actual name, instead of a title. Deezy (voiced by Chuck Deezy) – Mike Tyson's agent. Unnamed foul-mouthed NYC limo driver, voiced by Hugh Davidson. Carol (voiced by Jill Matson-Sachoff) – Mike's short-term wife. Jillian Davis (voiced by Cheryl Hines) – A Newport Beach socialite. The series has received mostly positive reviews from critics. The show currently holds an 82% rating on Rotten Tomatoes based on 11 reviews, with its consensus being: "A dizzying whirl of lowbrow and high-concept, Mike Tyson Mysteries should more than satisfy fans of Adult Swim's signature blend of animated silliness." Metacritic gives the show a score of 75/100 based on six reviews, indicating "generally favorable" reviews. ^ "MIKE TYSON MYSTERIES — LEE STIMMEL". LEE STIMMEL. Retrieved 4 June 2018. ^ "Giancarlo Volpe - Little known fact: I directed and helped develop..." Giancarlo Volpe. Retrieved 23 March 2018. ^ Burlingame, Russ (October 14, 2014). "Robot Chicken and The Mike Tyson Mysteries Release New York Comic Con Trailers". comicbook.com. Retrieved October 14, 2014. ^ Obenson, Tambay A. (9 May 2014). "Adult Swim's 2014-2015 Slate Will Include 'Mike Tyson Mysteries' – A Half-Hour Animated Adult Comedy". Retrieved 23 March 2018. ^ "Swim Sets 'Mike Tyson Mysteries' Season 3 Bout for May 14". Retrieved 23 March 2018. ^ "Full episodes and TV Listings- Zap2it.com". 1 September 2017. Retrieved 23 March 2018. ^ "Adult Swim". www.facebook.com. Retrieved 23 March 2018. ^ "Mike Tyson Mysteries: Season 1". Rotten Tomatoes. Retrieved November 5, 2014. ^ "Mike Tyson Mysteries: Season 1". Metacritic.